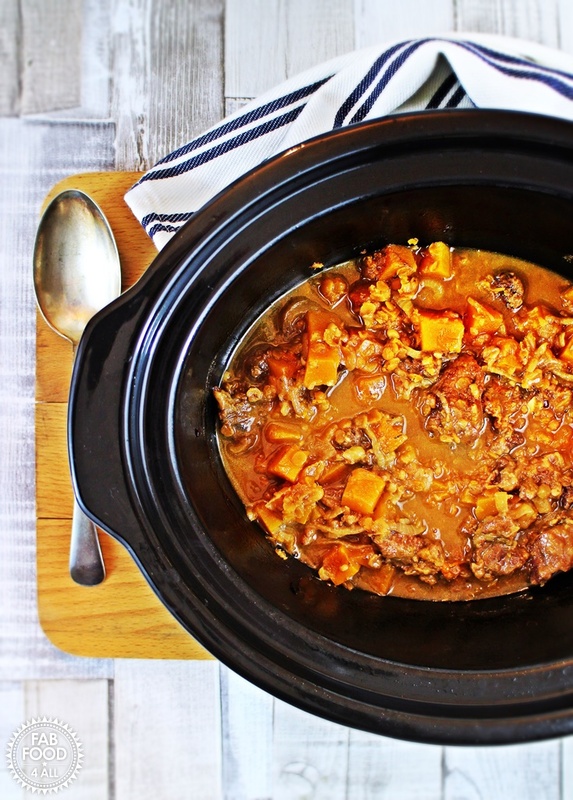 Today I’m bringing you Slow Cooked Beef & Butternut Squash or should I say we! Do you ever go to cook dinner but then someone in your family says they want something slightly different? Well this happened yesterday in the Fab Food 4 All household so I waved a white flag and told hubby that it was probably best if he cooked the dinner. In the end though, the meal was a collaboration between the two of us as I was roped in as sous chef. There was debate about various elements eg I said the casserole could do with a little thickening and thought that barley would be a good addition, hubby disagreed but compromised with the addition of red lentils. Hubby wanted 2 stock cubes and I wanted one and so it went on! So with all the power struggles over this dish you might have thought it would end up being terrible but I’m very happy to say that the result was indeed delicious! We didn’t have any red wine in the house so used up some Rosé which worked well. 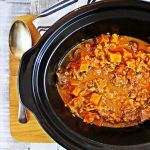 The butternut squash is great slow cooked as it adds a lovely subtle sweetness to the casserole. I had a pack of frozen mash in the freezer so served the Slow Cooked Beef & Butternut Squash with this and some peas for a really easy meal. I do love slow cooking as with a little effort earlier in the day you reap the delicious benefit hours later. You could easily double this recipe and either freeze the rest or have it the following day, leftovers always taste even better don’t they! 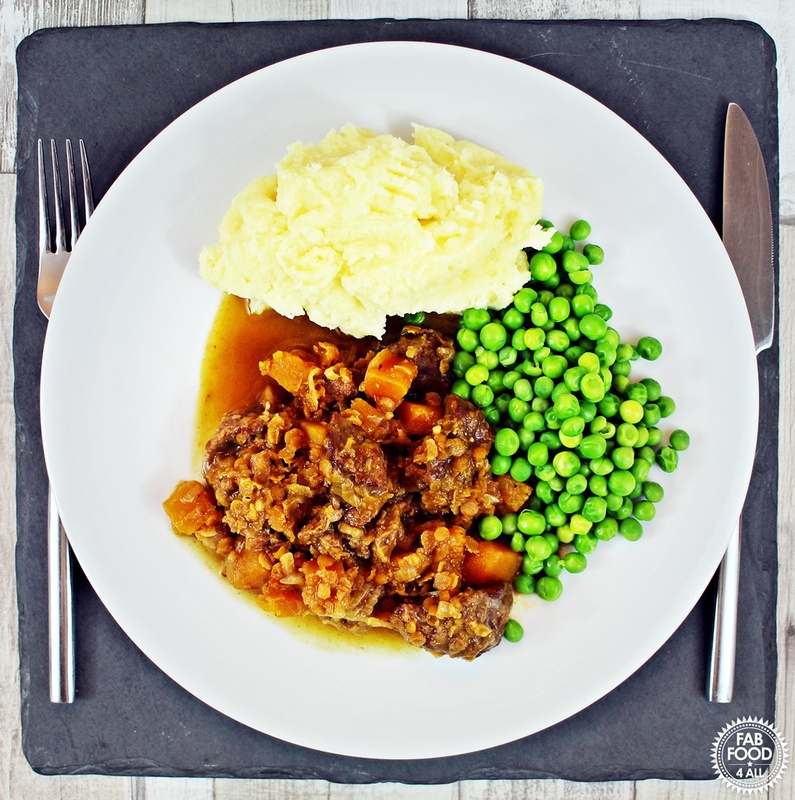 Slow Cooked Beef & Butternut Squash is a simple and comforting casserole with a splash of rose wine, serve with mash and peas for a great family meal. Put the beef in a bowl and sprinkle over the flour and seasoning. Toss to coat. Heat 1 tbs of oil in a large pan/wok and fry the beef in 2 batches until just browned. Transfer meat to slow cooker. Add another tbsp of oil to the pan and gently sweat the onions under a lid (stirring occasionally), takes about 10 minutes. Add the garlic, butternut squash and red lentils and fry for another couple of minutes, stirring. Then add the beef, bay leaves, thyme, Worcestershire sauce, wine and stock. 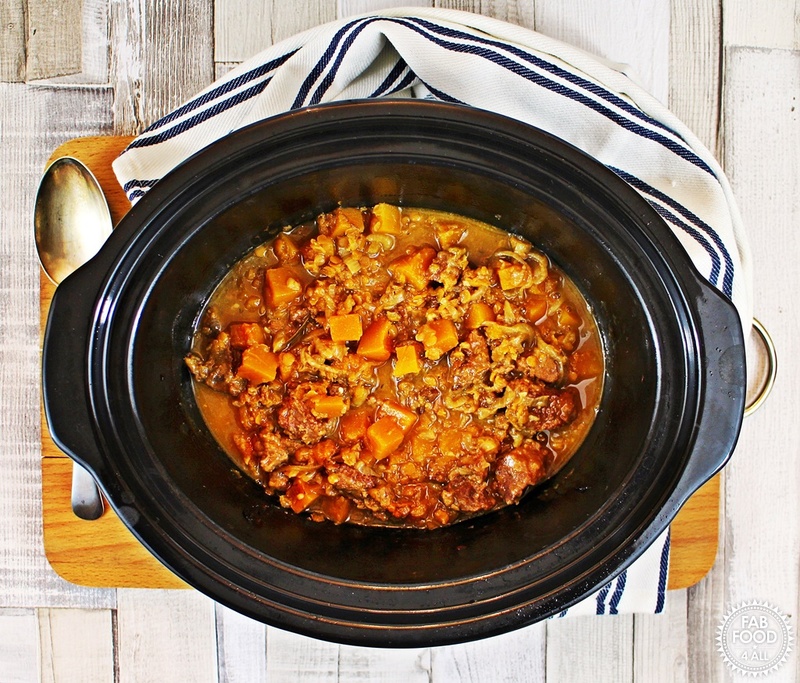 Transfer to slow cooker and cook on high for 5 - 6 hours or low for 7 – 8 hours. Previous Post: « Macabella Croissant Pudding – full of chocolatey, macadamia yumminess! One of the best things about winter is being able to enjoy meals like this!